The number on the back is LGRP 25926. Has been suggested the date as 1908-9 and photographer was F. M. Binns. But Which Station ? I think that the design and layout of the roof support columns match those between platforms 8 and 9 at what is now Manchester Piccadilly. I purchased a copy of this view from Ian Allan Ltd in the 1980s when this company marketed prints from the LPC and other collections. I did so believing the view to be Birmingham New Street as stated on the LPC LNW Locomotive list. Clearly it is not Birmingham New Street, and I was later reliably informed that the station is Preston (LNW & LYR Joint). An article by F M Binns, Assistant District Locomotive Engineer, Accrington, appeared in the Railway Magazine during 1946, so he must have been quite young when he took this photograph in 1908 or 1909. I know nothing else about him, but information about railway photographers at this period would be interesting. The Society publication “An Introduction to Preston” by Richard Foster confirms that this is Preston. The pillars and girders at Manchester London Road were not like this. I have a correction to make, my assersion that F.M. Binns had an artice in the Railway Magazine in 1946 is false. The correct magazine and reference is: Locomotive Magazine and Railway Carriage and Wagon Review, Vol. 52, No. 646 (15 August 1946), page 128, L.M.&S.R. Appointments - F.M. Binns, Assistant Locomotive Superintendent, Accrington. I have heard (from two knowledgeable sources) that this is Leeds. As I don't know Yorkshire well, and cannot find any useful photographs, I can’t really comment. So I can only mention it, just in case someone else might have an opinion. This is quite possibly Leeds (New). I was rostered ODM fitter here during the early 1960s, immediately before the first of the rebuilds that have taken place since, and at that time railwaymen referred to it as Leeds City (South). Checking with photos in "Leeds Termini" (Pixton and Hooper) the roof pillars and their flat arched bracket castings are the same. I am uncertain aboutthe "match" of the roof window glazing bar configurations, and also of the point where the mansard roofs meet the ridge and furrow roof sections at ninety degrees beyond. 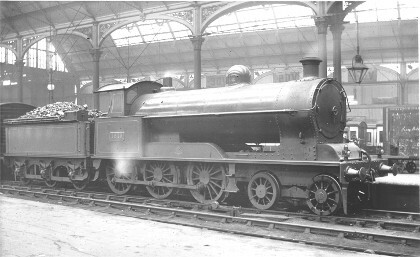 If we assume that this is indeed Leeds City, the 19‘ goods is standing in Platform 3 (LNWR numbering, platform 9 during the BR period when I knew the site) and the photo is taken from Platform 4, later 10. The engine is facing East, and the view is to the North. The station refreshment rooms were a little distance to the right between Platforms 2 and 3 and as the bays were diverging were of a peculiar plan footprint . There were two carraige sidings between platform tracks 1 and 2, and one between platform tracks 3 and 4. I really am struggling with this one. I am going to have to find some time to look at other photos, and compare them for any absolutely positive identification of this location. I thought of Manchester Exchange — but the girders are quite wrong. Although I like the idea of Leeds [New], there is one little doubt for me — the gas lamp. It looks LNW to me . That would rule out Leeds, as it was the North Eastern who did the maintenance, and provided the “furniture” — lamps, water cranes, and the like. So not much help I’m afraid — but still scratching my head! The answer is definitely Preston. And the reason for this is the rooves you can see in the photo. Birmingham New Street, Manchester Exchange and Manchester London Road, all had curved rooves. And Leeds New Station had a Mansard [or French, or curb] roof. Or put another way, two “slabs” on each side. But in the photograph here, the rooves have just a single slab. Therefore the location must be Preston, North Union side. Now there is an intermediate track between the Platform the photographer is standing on, and the one on which the train is placed. Therefore there are only two solutions. Either the photographer is standing on Plat 2, with the loco on no 3; or our recorder is on the Horse Dock, with the 4-6-0 standing in no 1 Platform. There are no other possibilities. And of the two, the former is the more likely. The engine is facing south. So now can anyone else “nail” this one for us? For the record, the engine is No.1610 (19-inch goods built 03/08). There are LNWR carriages on two tracks in the background, which I think rules out Leeds. I am still confident that this is Preston. Preston station has architectural details which are not those seen here. On the evidence of photographs this is clearly Leeds New.